NC Fiduciary Litigation Attorney, Kirk Sanders, and co-counsel, Bryan Thompson, settled a lawsuit against the power of attorney for an elderly octogenarian. The case was filed, along with discovery and a motion for a preliminary injunction to protect the assets. 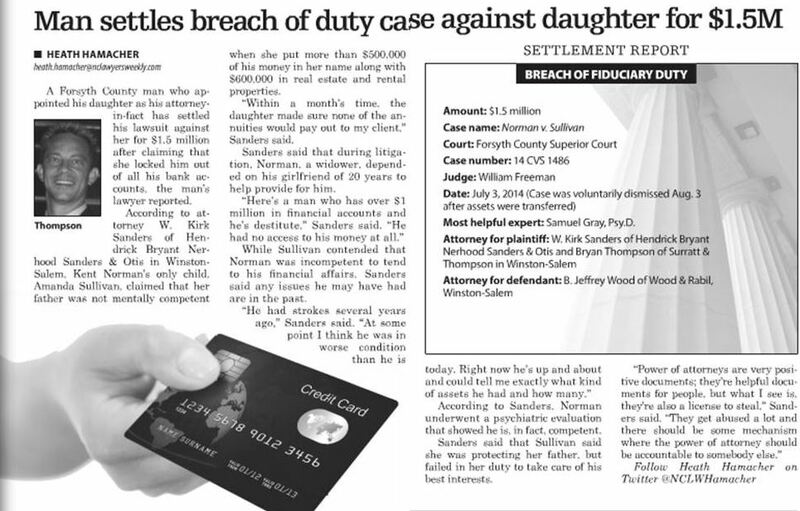 The case was reported in North Carolina Lawyers Weekly, September 28, 2015 edition. The elderly plaintiff had $1,000,000 in financial assets taken out of his control and name. Within 2 weeks, the power of attorney went to the plaintiff’s banks, closed all his accounts, and transferred the money to sequestered, unknown banks. The plaintiff, through his fiduciary litigation attorney, immediately demanded the return of all the funds. Plus the plaintiff revoked the power of attorney document filed with the register of deeds. Quickly a complaint was filed and served on the defendant power of attorney and her spouse. After the case continued and on the eve of the preliminary injunction hearing, the case was initially resolved. The settlement was formalized with a settlement agreement and a consent order. In addition, over $500,000 in real property was deeded out of his name to the power of attorney such that the agent received the remainder interest of a life estate deed. Kirk Sanders, head of Hendrick Bryant’s Fiduciary Litigation Section, has litigated numerous power of attorney abuse cases and fiduciary litigation matters.